The persistence in VIRCAM is very low and only has a minimal effect after observations of extremely bright objects. However the small effect persists for a while, the following is another H band image obtained 4 minutes after the observation of the star. After 6 minutes from the main observation the effect is completely zero. A more frequent occurence is low level persistence from the cores of heavily saturated stars. This is illustrated in the following sequence of J-band observations taken on 20100331 for part of the UltraVISTA survey. The left- and right-hand panels are two successive frames (DIT = 30s, NDIT = 4) taken about 2 mins apart in time. 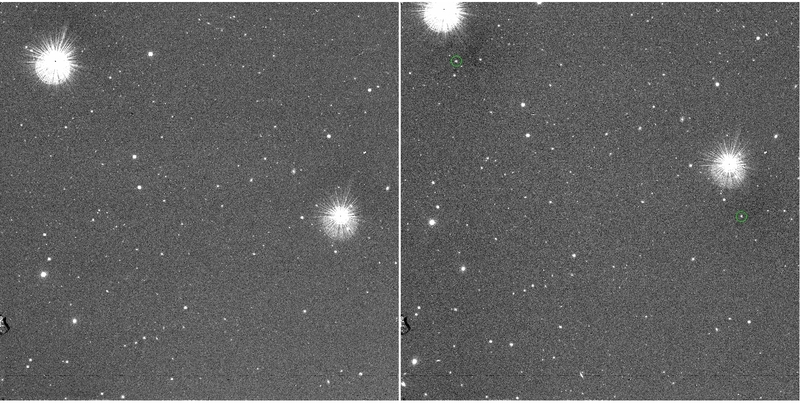 The cores of the two bright saturated stars leave behind small remnant images in the next frame in the dither sequence (circled in green). The final stack, made up from of 30 such images is shown below. There is now nothing visible at the positions of the remnant images, again denoted by the green circles. Since the overwhelming majority of pipeline science product images are stacked after an FPJME sequence, remnants from persistence will disappear during stacking. Note that this is not the case with an FJPME sequence where stacking will simply re-enforce remnant images rather than reject them.